Vascular Ultrasound is a non invasive (safe, well tolerated) medical test used to check the arteries and veins in the body. Artery and vein problems include narrow areas, blockages, dilated areas (aneurysms) and abnormal connections. How is a Vascular Ultrasound Test Performed? Sound waves image the body’s arteries and veins in two ways. First, the machine sends a sound wave into the body. Then, the machine listens for the return of sound waves. The sound waves reflect off organs and vessels. So, the returning information makes a black and white image. Second, doppler determines the speed and direction of flow. The reflected sound waves off the red cells give speed and direction of the moving blood. A duplex examination, combines ultrasound pictures and doppler to check blood flow. Assignment of color to the moving blood shows direction. Color assignment is set by the technologist. So, color does not show artery versus vein. What is Vascular Ultrasound Test used for? Duplex ultrasound of the leg arteries shows blockages that can cause leg pain with walking. 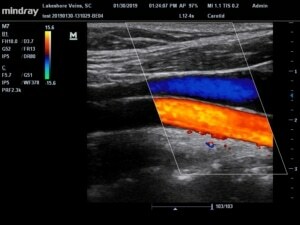 Duplex ultrasound of the leg veins shows clots in the superficial and deep veins. The other name for deep vein clot is deep vein thrombosis or DVT. Vein Mapping tests blood flow moving against gravity. Therefore, the sonographer tests the valves in the leg veins for leakage. Leaking valves is also known as venous insufficiency. How do I prepare for a Vascular Ultrasound? There is no special preparation for vascular ultrasound of the legs or neck. However, you will likely need to hold food and water for 8 hours before the examination of the abdomen. Holding food and water is necessary for abdominal examinations to decrease bowel gas which hides the abdominal vessels and organs. Who should perform my Vascular Ultrasound? Skill and training of vascular sonographers can vary. Most importantly, the quality of the examination is necessary to diagnose medical problems. Therefore, look for a seal of accreditation either by the Intersocietal Accreditation Commission (IAC) or the American College of Radiology (ACR). Accreditation of the lab makes certain the person performing your examination has approved credentials. How Long Does a Vascular Ultrasound Take? A vascular ultrasound takes thirty to sixty minutes. Occasionally, a complex ultrasound can take up to 90 minutes. Lakeshore Veins, a vein and vascular clinic in Mequon, WI, is IAC accredited in Vascular Ultrasound. We are happy to answer any more questions you may have.